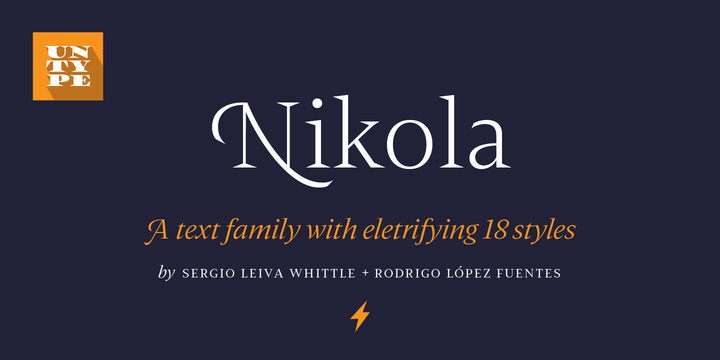 Nikola is a typeface created by Sergio Leiva Whittle together with Rodrigo López Fuentes and published by Untype which is available in 18 styles, 9 weights (from Thin to Heavy) with accompanying italics, over 1400 glyphs, and multilingual support. It has Decorative Cartouches, thanks to the magic of OpenType, borders and two sets of electrifying swashes to mix. It was designed to be suitable to any kind of project such as branding, editorial use, display, text etc. Enjoy! Price: starting from $29,00 for one font to $245,00 for all 18 fonts. A font description published on Monday, January 15th, 2018 in Fonts, Rodrigo Lopez Fuentes, Untype by Alexandra that has 1,175 views.